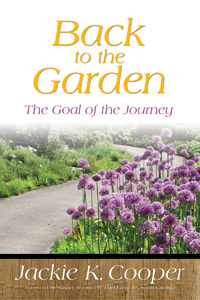 Back to the Garden: The Goal of the Journey is the sixth book in the Journey series by beloved Southern author Jackie K. Cooper. The stories in this new book, as well as those in the past books, are based on Cooper’s memories of his life in the South. each story emphasizes an event in Cooper’s journey through life and builds an overall picture of a man who is trying to live a life that will get him “back to the garden” where he will be eternally happy as well as at peace. The stories vary in their portrayal of this everyman’s ability to deal with the humorous and the dramatic events we all encounter on our journeys. Readers of these stories will find a commonality with the author as they recognize their own situations in his. This sharing of life stories is what has made Cooper’s books so endearing and so popular. He writes with a sharp eye and an attuned ear in order to discover the commonplace occurrences as well as the unique situations. Cooper’s quest is to be the best person he can be and his books highlight the struggles to achieve that goal. The reader will be encouraged by this book and will be entertained by it. life is a journey full of highs and lows and Cooper portrays them with accuracy and warmth. In Back to the Garden, the ever-masterful Jackie K. Cooper plants words of goodness, fertilized with a heap of common sense. He adds a sprinkle of tears and bright rays of laughter. It's an award-winning formula that ought to earn this charming storyteller Best of Show. A beautiful compilation of gems told with the soft-spoken voice of a true Southern gentleman. Sweet and nostalgic, Jackie K. Cooper recreates times and places we all want to relive. Reading this book is like curling up in a favorite chair with a hot cup of cocoa. Words of wisdom told from a life welllived. Back to the Garden made me laugh and cry, and made me grateful to know that men like Jackie Cooper are still around.